Thursday October 4, 2012 – Community activist turned vice presidential candidate Dr. Robert Ornelas is anything but common. He has broken the mode on so many levels when it comes to what is “normal” regarding politics and entertainment. He truly is the underdog and honest voice for the people. He is unashamed to exercise his faith and mature enough to respect others who exercise their own faith. 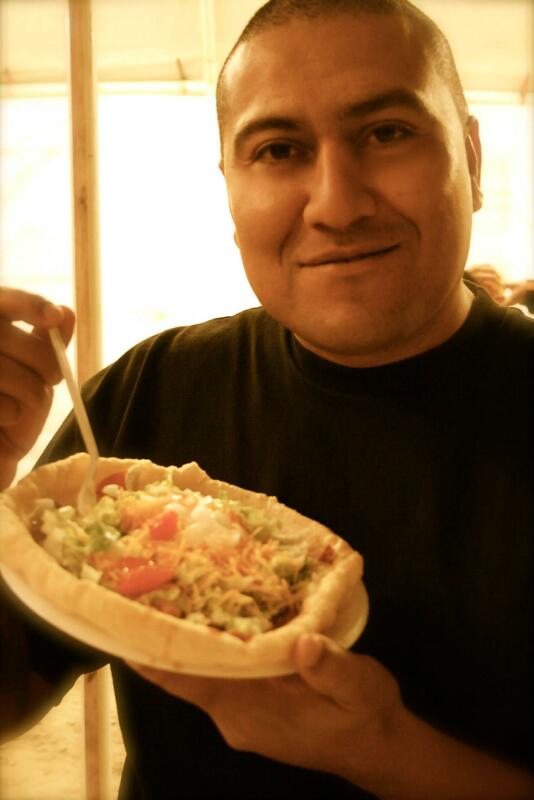 It is no surprise to find the first Latin American vice presidential candidate at the Northern Navajo Fair enjoying a Navajo Taco on National Taco day. Mexican Dish A taco is a traditional Mexican dish composed of a corn or wheat tortilla folded or rolled around a filling. A taco can be made with a variety of fillings, including beef, pork, chicken, seafood, vegetables and cheese, allowing for great versatility and variety. A taco is generally eaten without utensils and is often accompanied by garnishes such as salsa, avocado or guacamole, cilantro, tomatoes, minced meat, onions and lettuce. Native American Dish Frybread (also spelled fry bread) is a Native American food found throughout the United States. Frybread is a flat dough fried or deep-fried in oil, shortening, or lard. The dough is generally leavened by yeast or baking powder. Frybread can be eaten alone or with various toppings such as honey or hot beef. It is a simple complement to meals. Frybread is the base of an Indian taco, which is topped with ground beef, tomatoes, cheese, onions, and lettuce. Frybread has a significant role in Native American cultures. It is often served both at home and at gatherings. The way it is served varies from region to region and different tribes have different recipes. It can be found in its many ways at state fairs and pow wows, but what is served to the paying public may be different than what is served in private homes and in the context of tribal family relations.